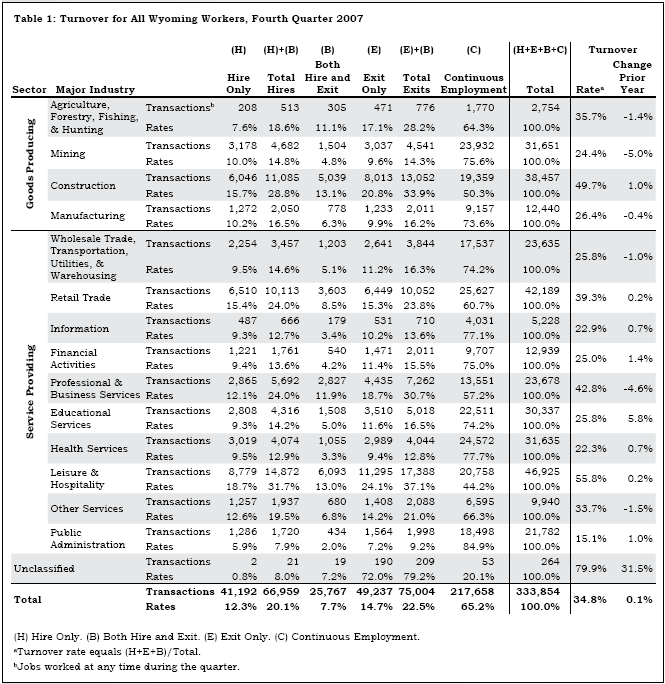 The fourth quarter 2007 (2007Q4) statewide turnover rate stood at 34.8%, an increase of 0.1% from fourth quarter 2006 (see Table 1). Educational services’ turnover increased the most compared to the prior year (5.8%). 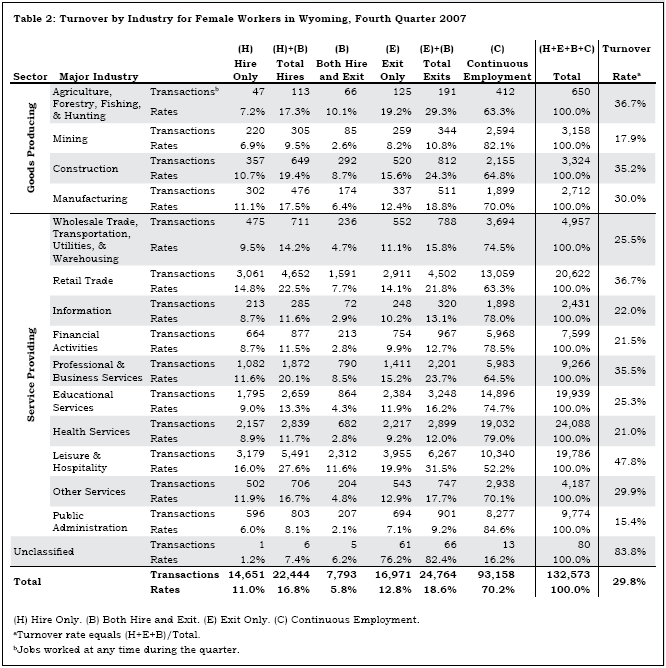 Other industries in which turnover was at least one percentage point greater than in the prior year include financial activities (1.4%), construction (1.0%), and public administration (1.0%). The largest percentage declines in turnover occurred in mining (-5.0%), professional & business services (-4.6%), and other services (-1.5%). While it is useful to observe overall market trends, an examination of underlying trends may provide additional context. Table 2 provides 2007Q4 turnover statistics for Wyoming’s female workers. Overall, female workers were less likely to leave employment (29.8%; see Table 2) than the total population of workers (34.8%; see Table 1). Turnover for women was higher than for all workers in several industries including agriculture, forestry, fishing, & hunting; manufacturing; and public administration. Public administration was the only industry of the three in which women comprised a majority of workers. We can combine turnover analysis with other statistics to provide additional labor market insight. Recent research indicates that Wyoming Unemployment Insurance (UI) benefit exhaustion rates have declined steadily since 2002 (Wen, 2008). However, benefit exhaustion rates both for women and for all workers age 65 and older tend to be higher than for other demographic groups. Confounding the analysis are the turnover statistics for both groups. As cited in the prior paragraph, turnover rates for women were generally lower than for the entire workforce. The same was true for workers in the 65 and older group (Leonard, 2008). Turnover for this group of workers was 27.1% in 2007Q4, 7.6% less than for the overall population. Although benefit exhaustion rates for women and workers at least 65 years of age were greater than for the population in general, turnover does not appear to be the underlying cause of exhaustion. Leonard, D. (2008). [Turnover statistics for Wyoming workers age 65 and older.] Unpublished data. Last modified on by April Szuch.